The supremely versatile Monitor Audio Apex A40 can be used vertically or horizontally to provide electrifying audio realism characterised by soaring dynamics and low distortion. Equipped with twin Apex bass drivers, the A40 excels at low frequency depth and mid-band evenness over a wide listening area. It radiates with the full force of a single 8” bass driver, but has the advantage of superior power handling and a wonderfully smooth audio consistency. What’s more, the single bolt fixings for its drivers give the longer A40 cabinet an especially rigid structure, banishing any hint of boxy colouration, especially from on-wall positions. 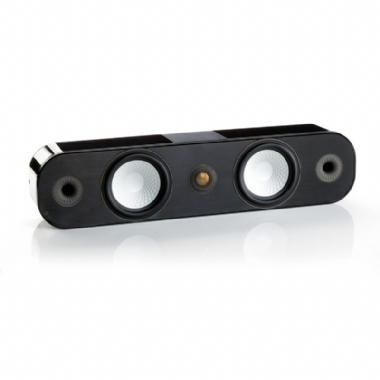 The A40’s slender profile and glossy lacquer finishes make it a match for super-thin video displays: its beautifully engineered bracket allows for forward and backward adjustment to align the speaker with the front of the screen but also allows the A40 to tilt 22.5º upwards and downwards for optimum setup. Perfect for high quality sound where space is at a premium, and devastating when teamed with the explosive AW-12 subwoofer in a 5.1 channel configuration, the A40 will deliver simply breath-taking audio: discreet but oh so devastating.